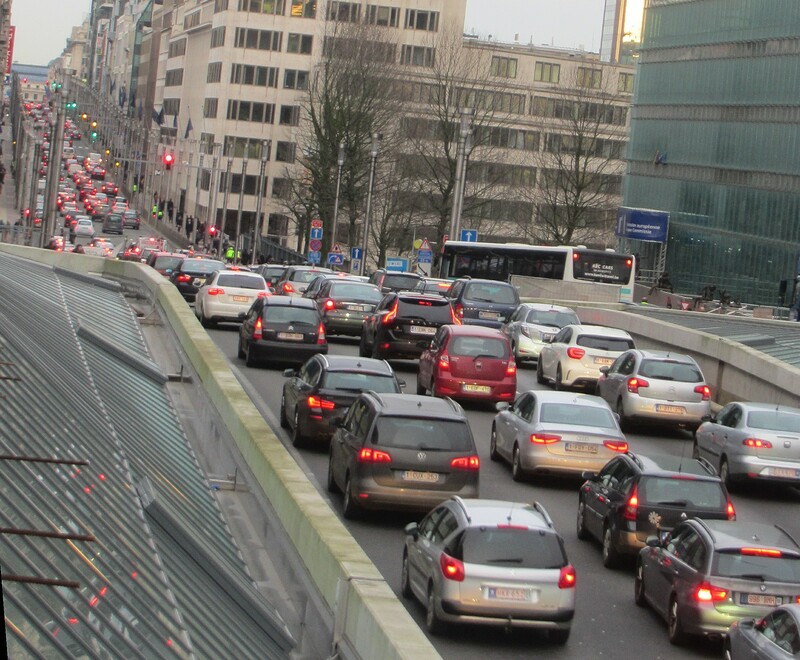 Welcome to congestion week in Brussels. So bad we almost despair – unless we ride our bikes. It has been congestion week for me. A celebration of traffic management failure. 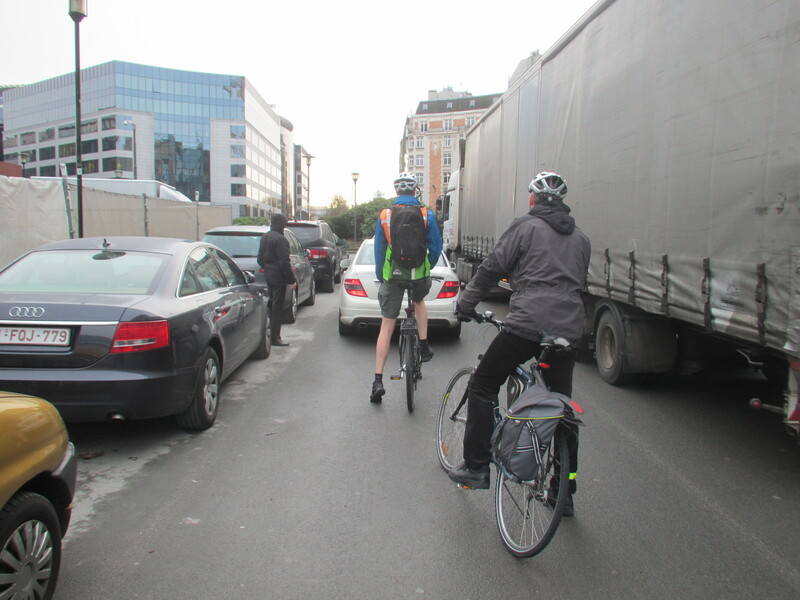 Last week I was inspired by the thought that Copenhagen has so many cyclists they suffer traffic jams and road rage. I have spent much of the past two weeks discussing congestion too. The EU is currently accepting pitches for its research budgets and included in the offer is some substantial funding to address the congestion that is slowly paralysing many cities and roads throughout the union. I am involved because one of the approaches that needs validating is the effect of more cycling and walking on congestion. We are working with some partners to prepare better evidence to stop politicians panicking every time a local lobby says cycling facilities and pedestrianized city centres cause congestion. So we have been locked in rooms having some really interesting discussions with cities about their commitment to their transport problems and in general it has been quite refreshing, because of course the people we are sitting with are the enthusiastic partners. 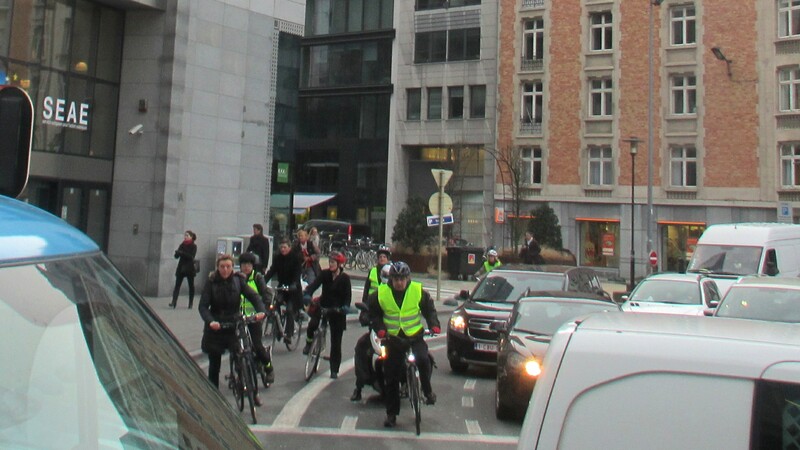 However for those of us based in Brussels it has also been congestion week for another reason. Just a few days ago the trial of a “kilometre tax” was announced which will test the effect of charging 1200 drivers for the distance they travel in Brussels. Something is needed because the city and its surroundings regularly feature in the lists of Europe’s most congested cities and is getting steadily worse. I was watching an item from Brussels on the BBC News that just about sums it up. They have one of those back projections behind the reporter that supposedly shows a typical city skyline. 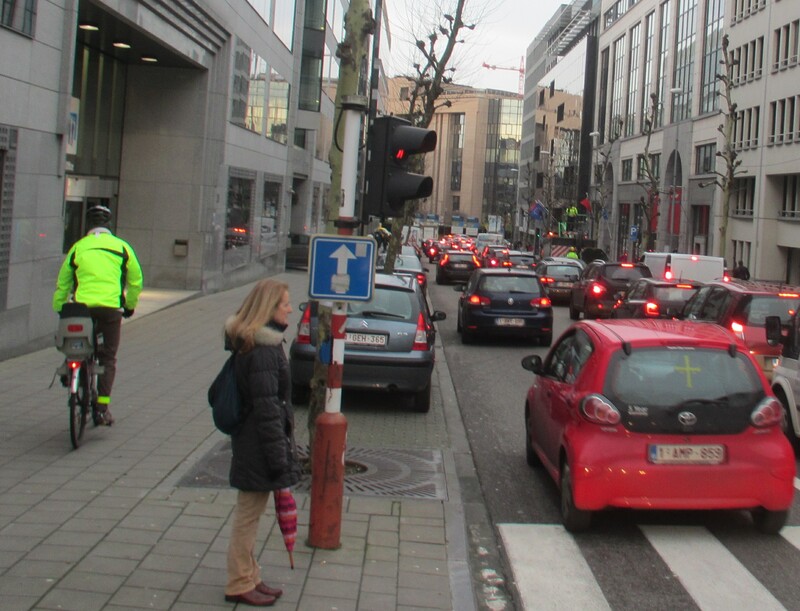 The Brussels one always shows just a huge queue of traffic gridlocked around the EU district from morning till night. However there has only been one noise louder than the traffic this week. That is the sound of politicians of all parties running as far as possible from the congestion charge. And in Belgium that is a hell of a lot of politicians. To start with there are at least 12 parties but they are then divided up into the Federal Government and the regional parliaments for Brussels, Flanders and Wallonia. Guess what, there are elections coming up so they are all dashing furiously for cover, much to the disappointment of anyone who hoped that this might be a start in the right direction. Apparently the possible trial was buried in the small print of a proposal to try and ease freight congestion, but now the politicians have left the Minister for Mobility in Brussels region to carry the can as they say “no we didn’t mean that”. Astonishingly even the Greens (Ecolo) (*see comments) have distanced themselves because “the measure might adversely affect people on low incomes”. All this goes against a backdrop of every previous failed initiative such as sensible stuff like reducing parking or madness like the short-lived Flemish proposal to add more lanes to part the Ring motorway. They never head the expression “Building roads to ease congestion is like loosening your belt to cure obesity”. It is just madness. So where does all this fit into my cycling blog? 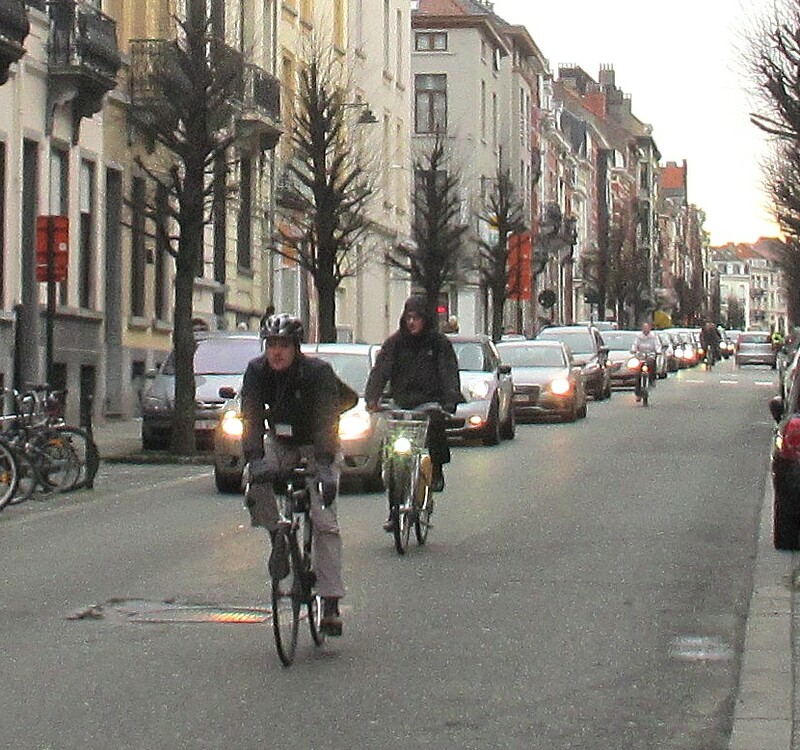 Brussels cycling has apparently quadrupled from 1% of traffic to about 4%. City officials are patting themselves on the back because they have put in a very few cycle lanes and quite a bit of paint on the roads, but mainly they have been completely blocked by the politics of the region and the fiefdoms of 17 commune mayors who regard the loss of a single parking spot as an act of treachery from outside. So why the growth? Because if you make everything else bad enough people will ride bikes. 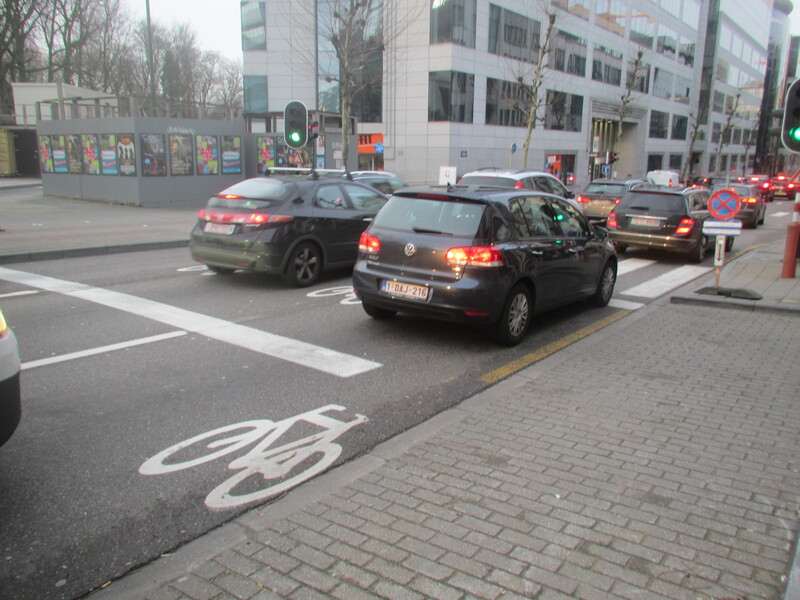 Despite the fact that the cars slow the bikes far more than the bikes block the cars and the white paint on the roads is frankly useless it is still quicker and easier to get around much of our part of Brussels by bike than anything else. And for people who have to make multiple stops like dropping off kids on the way to work the parking congestion makes the bike an even bigger winner. 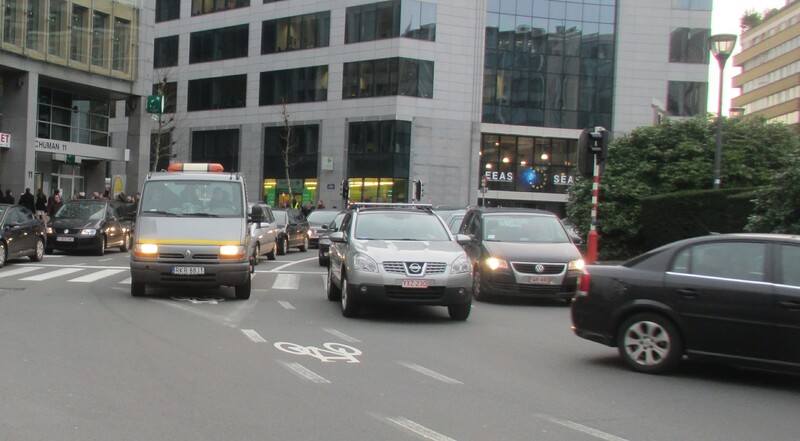 So here we all are in Brussels – the congestion busters. Up the outside of the parked cars, up the pavements and even occasionally squeezed into the cycle paths. Sadly when we look at our research into congestion I am sure we will find once again that the number of people prepared to try cycling like this is limited to about 5% of the population, the rest are just too scared. 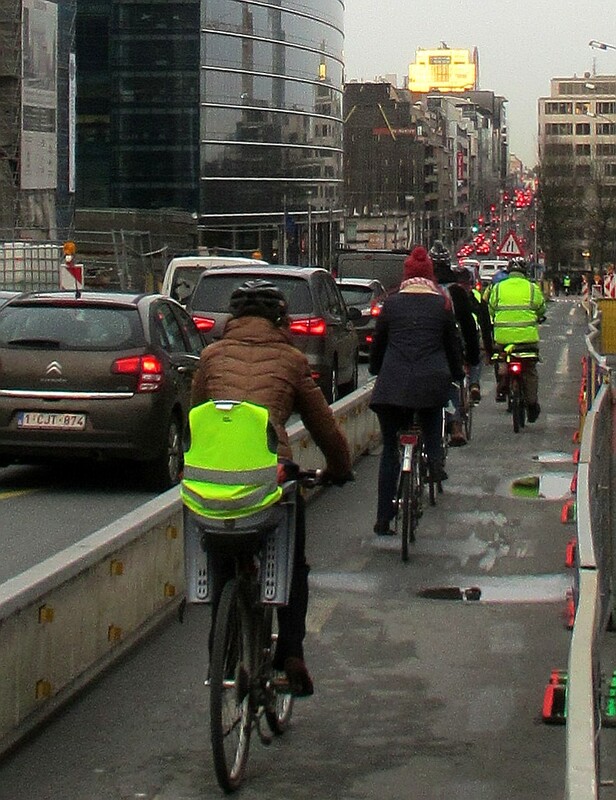 So the Brussels cycling boom has just about reached its limit until somebody has the political clout to impose themselves on the driving congestion. Don’t hold your breath waiting for that to happen. Copenhagen we are not. It really is not a solution. But those of us who are riding will not despair when the politicians fail us. I do not despair re-visits Copenhagen. Where cycling has become traffic. On Thursday I went to Copenhagen for a brief visit, whizzing in one night and then leaving just a day later. Back to back meetings, but even from this brief visit I was inescapably drawn onto the streets to get my fix of Copenhagen cycling. Let’s face it, I am a cycling geek. Who else would get up an hour earlier than needed so they can just go out into the dark and stand by the cycle lanes? My wife occasionally thinks I may be a bit creepy, standing by the road just sort of stalking the cyclists with my little camera. But I am sure the Danes are probably used to it, especially in Copenhagen. Amazingly since starting this blog this is my first visit to one of cycling’s great capitals and one of my favourite cities. I certainly don’t need to go there to support cycling or the cyclists’ movement, like many other visitors I go to learn and be inspired. In 2010 it was the host for one of the best Velo-city conferences when I had the enormous pleasure to be there with over a thousand delegates and then stayed on a for few days with my son to do some chilling and cycling. The instant I mentioned I was going to Copenhagen this week his immediate reaction was “I’m jealous” which pretty well sums up how we feel about the place. 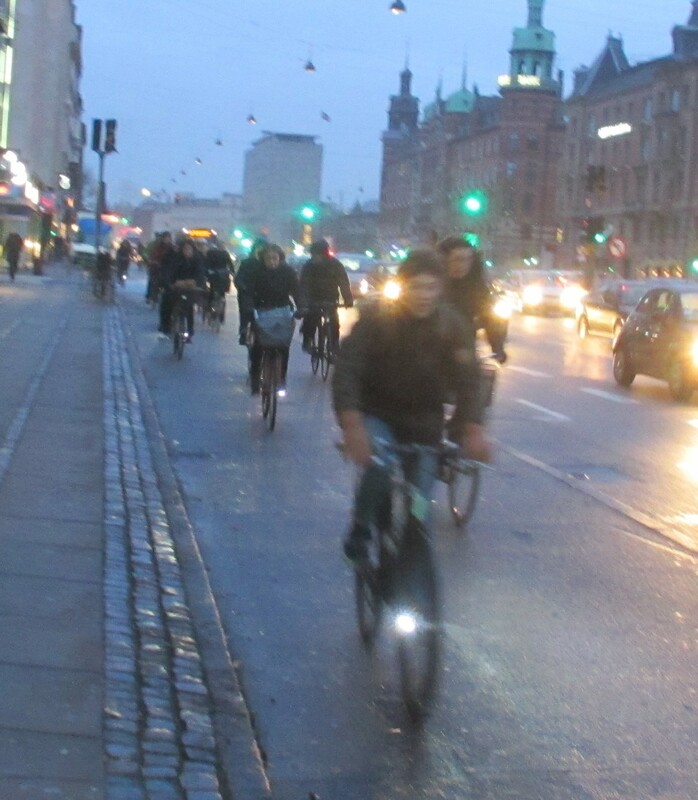 If HG Wells was truly uplifted by every cyclist he saw then Copenhagen would be like his wonder-drug. It also seems a little low key for me to be blogging about Copenhagen when it is the home and inspiration for one of the most followed and influential cycling blogs Copenhagenize. Mikael Colville-Andersen is undoubtedly one of the sector’s most successful communicators and has done a great job with his evangelical work to take the success of cycling in Copenhagen to the rest of the world. But here are a couple of thoughts that I have felt on previous visits to Copenhagen and which hammered themselves into my mind once again as I observed the amazing flows. 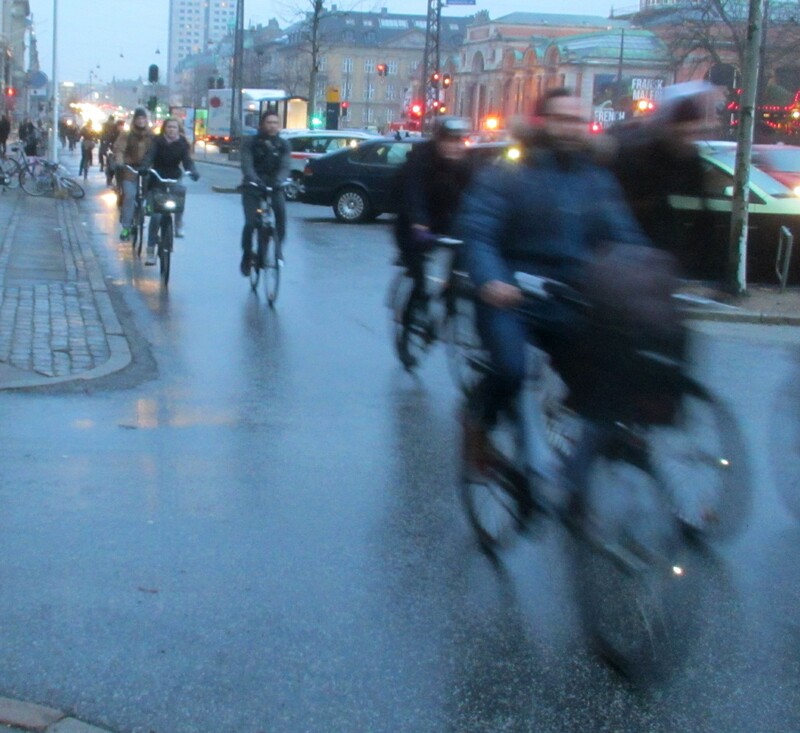 The first thing about Copenhagen cycling is the volume. Of Europe’s major cities its only competitor is Amsterdam where a similar 30% plus of daily trips are made by bike. 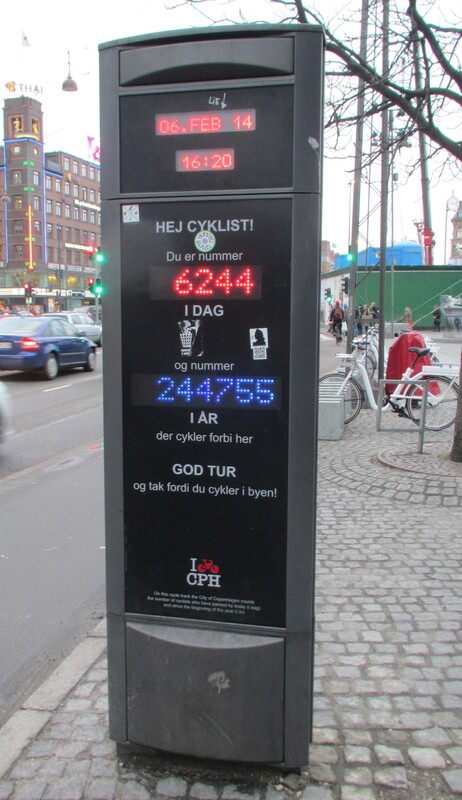 But in Copenhagen it seems to me that the cycling traffic seems more concentrated leading to huge numbers being recorded on the roadside cycle counters. 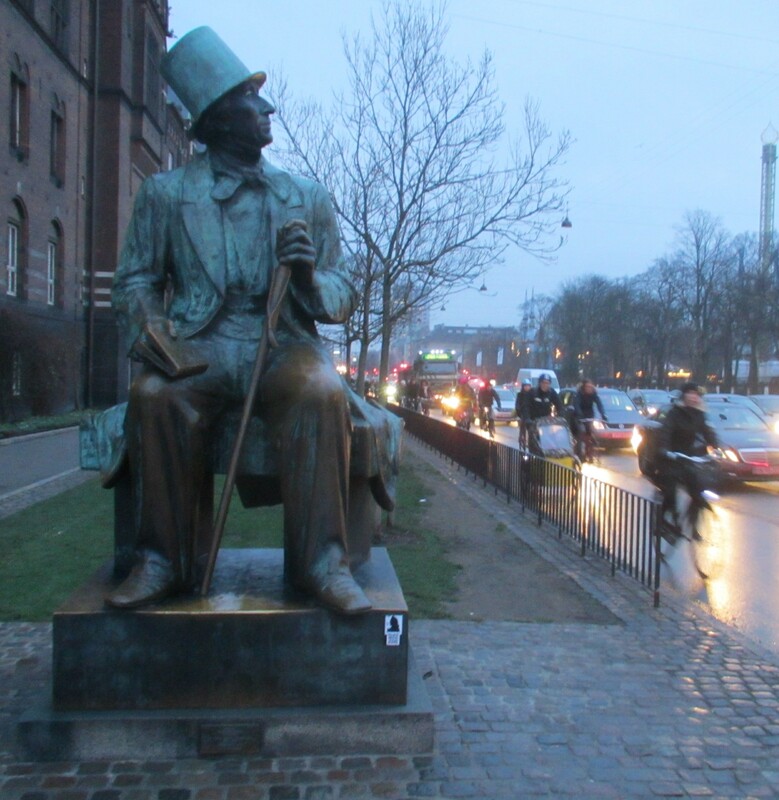 I was out at 7am and already several hundred had made their way along Hans Christian Andersen Boulevard. Then as I wandered the area around the City Hall and Tivoli Gardens and watched for nearly an hour the numbers just grew, hoards of Vikings looming out of the dark with their ubiquitous flashing white front lights. By 8am congestion is building up around the main junctions with cyclists tens deep waiting to move on. And this is cold, gloomy mid-winter. 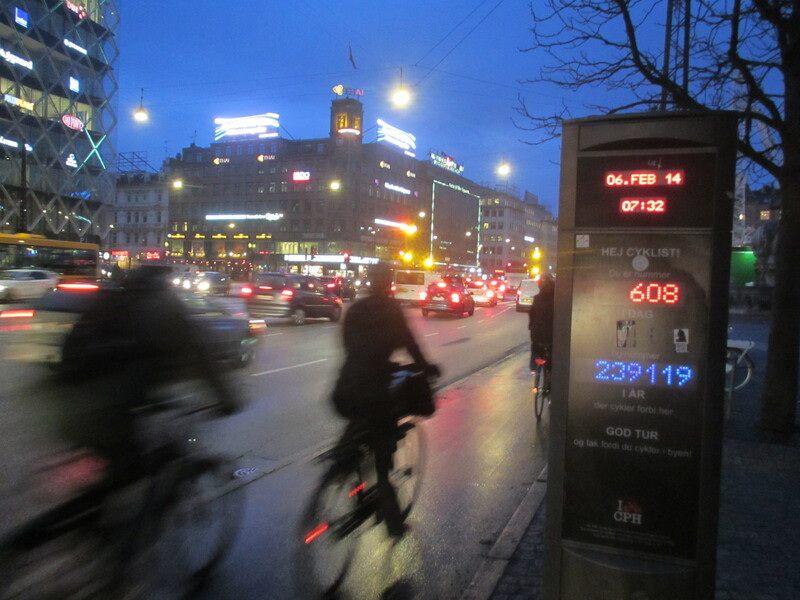 The second thing I always see in Copenhagen is the speed of the cyclists, whether I am riding, walking or watching. To a Brit brought on almost cycle free streets the first terrifying experience you get on every trip to Copenhagen is the moment you absentmindedly wander onto or across a cycle lane and a Dane comes zooming out of nowhere tingling their bell at your stupidity. But then I just stand and watch, realising that these people dressed in ordinary day clothes on sensible utility bikes are absolutely flying. A colleague told me he averages 20km per hour to work for every day despite numerous traffic light stops. He doesn’t regard himself as at all unusual and he certainly doesn’t require special clothes or a fancy bike. Even the macho male/sensible female split doesn’t apply here, the women seemingly ride just as far and fast and if my experience is anything to go by they are just as grumpy about idiot tourists in the cycle lane as the blokes. 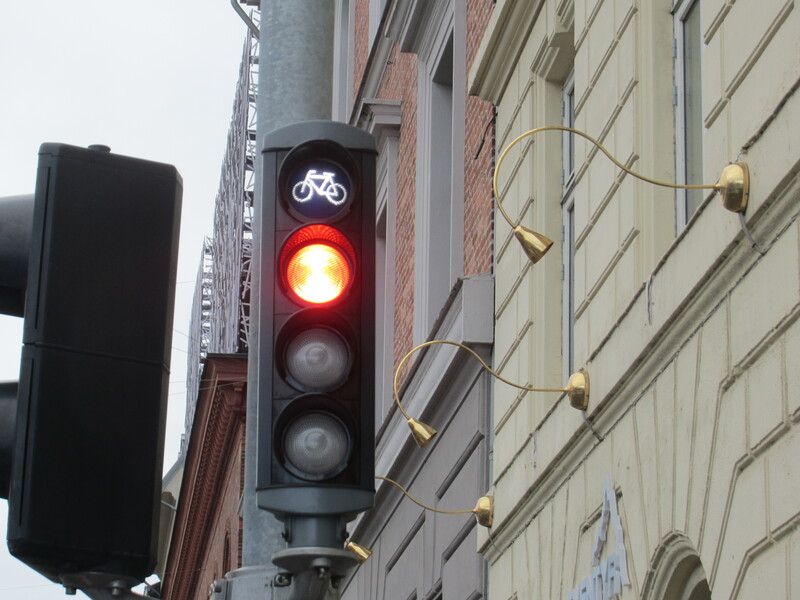 They have even implemented a traffic management system in Copenhagen called the Green Wave which allow the 35,000 commuters on the Nørrebrogade to cruise through synchronised green traffic lights at exactly 19.3km per hour. How cool is that. But I bet anywhere else that would be less than 15kmph. But away from the green wave the frequent traffic lights mean that the cyclists look like they are hunting in packs as they jump between the lights in swarms. Why 30 degrees? 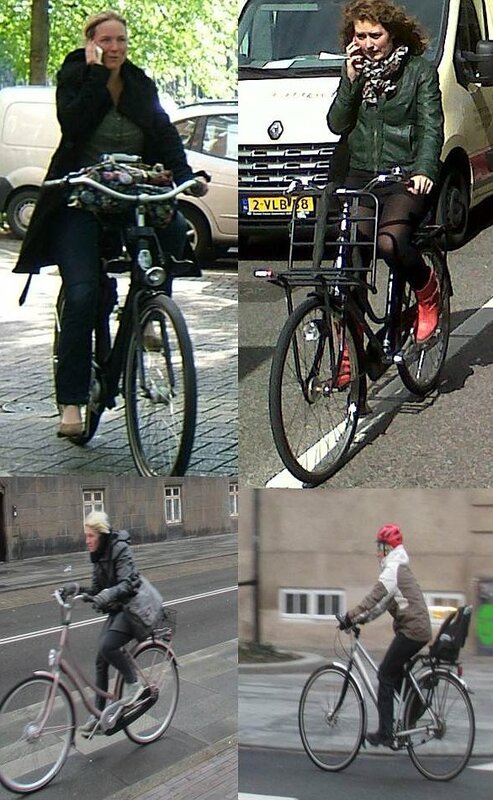 Because I reckon Dutch cycling style can be summed up by a gentle lean back in the saddle into a relaxed position about ten degrees from vertical, suitable for chatting, texting, eating, smoking or just about anything else, the bicycle itself is forgotten. That’s why they are sometimes called “wheeled pedestrians”. Not the Danes. 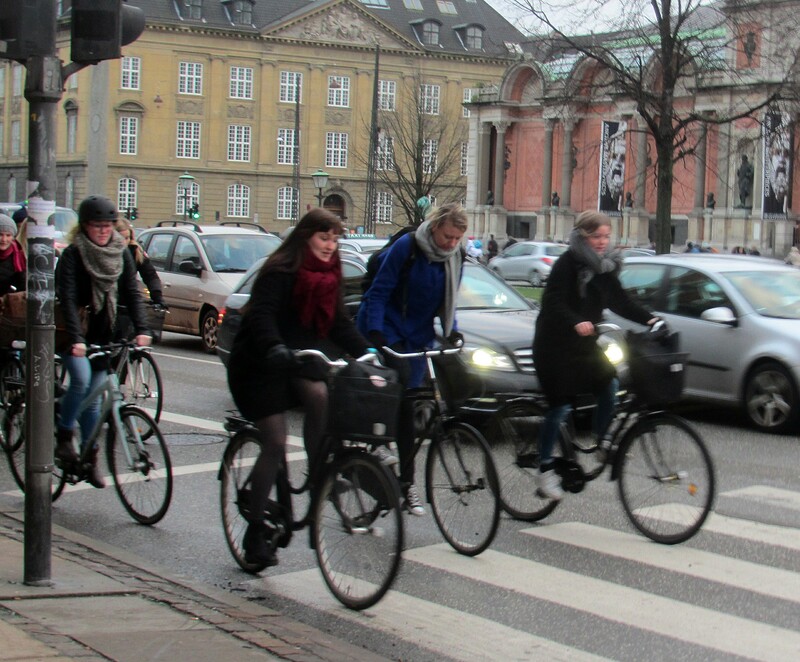 Danish cyclists lean forward, earnestly pumping the pedals, pulling the handlebars and zooming to the next junction. Maybe 20 degrees tilt forward, but rarely backwards. Look at this wave pulling from the traffic lights. One second they are resting and chatting then the young women are up out of their saddles heaving away like a pro peloton in case they get swamped from behind. Given their intolerance of bad cycling as well it seems that they behave …… just like car drivers! They even have their own version of trucks in the cycle lanes, the cargo bikes, just to complete the analogy. If we look to the future this could be it, bicycles as proper, full on traffic with speeding, congestion and road rage. Perhaps we should be careful what we wish for. I hope not, and even the Danes acknowledge that some of this behaviour is due to congestion and it is time to increase capacity on the bigger routes in the near future, their super-highway network. I could blame their speed for the fact that this blog post also suffers from the curse of the camera. My camera is great for stuffing in my pocket and travelling but sadly it is useless in half light, especially with motion. So given streets full of flying Danes the poor thing struggled terribly during my pre-breakfast wandering. So my apologies for the blurry crowd effects this week!